Midwest MLA 2013 is over and we on the planning committee hope everyone had a great time. Check some photo highlights from the Midwest MLA facebook page. We would like to thank everyone who helped out, attended and spoke. Special thanks to our speakers, Michelle Kraft and Sarah Houghton, for coming and speaking to the Midwest Chapter. A great thank you to our planning committee members as well. Thank you for all your hard work! Midwest MLA 2013 programming starts today! Check out the schedule and program on the conference program page. I’m also happy to announce that there we have recruited a couple of bloggers who will be posting to ConnectMidwest about Midwest MLA 2013! Be sure to check the blog for their unique perspectives on attending this conference. 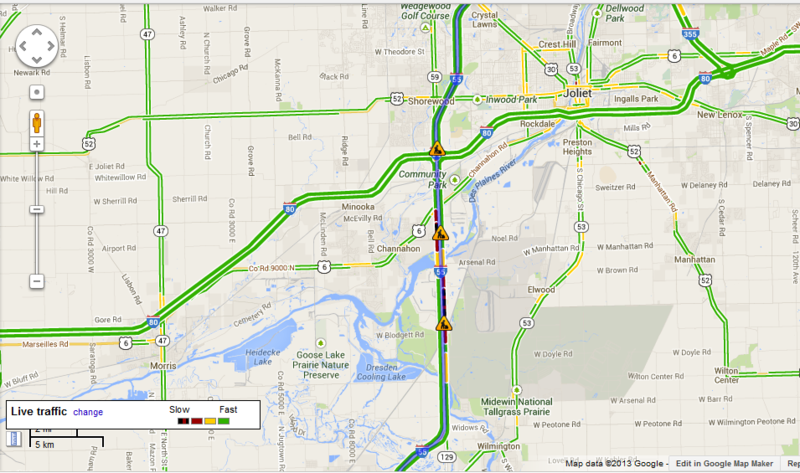 We have reports that travel on I-55 just south of I-80 (around Joliet) is difficult because of the construction. 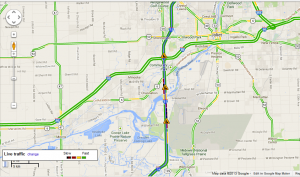 If you are driving from the Chicago area, please consider an alternate route. Note the slow areas on the map below. This is a last minute call for bloggers and photographers (and tweeters) for Midwest MLA 2013! We’re looking for bloggers and photographers capture Midwest MLA 2013 from their unique perspectives. Attendees with enthusiasm welcomed! No blogging or photography experience necessary. It’s a great way to get involved with the meeting, chat with fellow librarians and involve who are sadly absent. Interested? You can start getting involved right now at the Midwest MLA 2013’s Facebook page at https://www.facebook.com/events/496997097005012/. Add a comment, a picture and let us know you’re on your way! Information about policies will be covered at a meeting on Saturday, October 5 at 4pm in Fond-Du-Lac A-C. Contact Elizabeth Huggins at elizabeth.huggins.2012@gmail.com in you’re interested! The JUMP Simulation Tour is now full. Thanks to everyone who signed up! Attention Midwest Chapter/MLA Annual Conference attendees! Mentors are needed for the Mentor/Mentee Program! Great News! Response to the Mentor/Mentee program has been tremendous! So far I have 13 people who want to be mentees, but only 8 people who have volunteered to be mentors. The Mentor/Mentee Program connects newer members or first-time conference attendees with returning, more experienced members at the conference. Continuing Education course “Supporting Systematic Reviews: The Basics” on Tuesday, October 8, is full. Remember to sign up for the others before they’re full too! Check out the continuing education page a list and descriptions of the other courses still available.